Restoration work turns older to better than new condition at a fraction of the price of new installation. If your bathroom shower area is dirty and grungy and looks like it needs a complete makeover,we can make it look new. That caked up grout can damage the walls and floors if not taken care of properly, plus it is unhealthy to have that dirty grout. 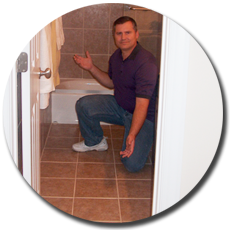 It's time to give us a call (919) 757-1913, you do not have to live with that kind of dirty grout and stained tile. Complete restoration services, from older to new. Turn older grout and tile back to new again! We seal all natural stones, grout clear or color sealed to last. Shower pans with calcium bleeds, repaired right! New Tile and grout installed anywhere it's needed. Floors, Backsplashes, Tub surrounds & Shower pans. Tub surrounds stripped, silicone replaced, grout sealed. Master bathrooms restored to better than new. Floors stripped clean & sealed to last. Check out our collection of jobs and projects we completed over the years! Photos of before & after, new installations & more! Rob was professional and courteous. He gave me a quick and comprehensive description of the problems and the work required. The work was executed on time and the results are awesome. My bathroom looks better than day one. Stained, dirty moldy and damaged grout and tile can be restored to make it look brand new. We pride ourselves on customer care, making sure to keep you informed through the entire restoration process. We never compromise work quality to protect our bottom line. Fill out our free online quote and let us know what you have in mind. Tiles come in many shapes and sizes as well as durable and long lasting. Hello and Welcome, my name is Bob Dinkel, President of GroutLines.com, Inc.
Our professional installers offer the highest quality in craftsmanship and the highest levels of integrity. Our goal is to ensure the complete satisfaction of each and every one of our clients. We stand by our work 100%. We are committed to excellence and customer satisfaction!